This post was originally published in 2016 but has remained extremely popular throughout the years. 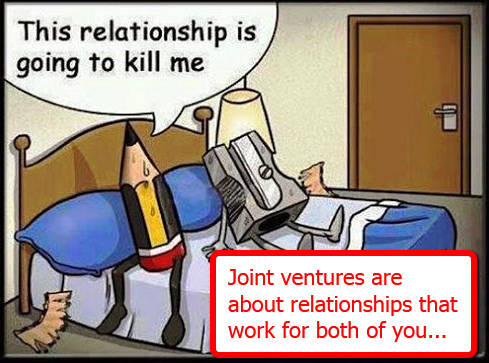 A joint venture (JV) is where two businesses agree to do something mutually beneficial and leverage each other to make more money. Products or services to sell that are targeted to that niche. One of the fastest way to fill in the elements you don’t have in that business model is to do a joint venture with someone who does have them. 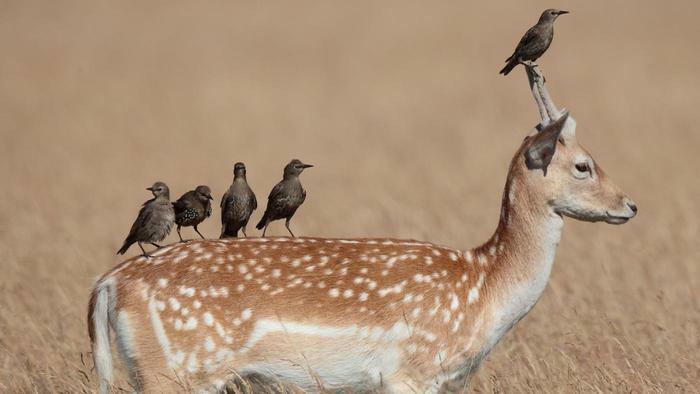 Have traffic, but not a product… do a JV. If you already have a successful online business joint ventures can give you access to large lists of highly targeted customers rapidly increasing your sales, customer base and email subscribers. In brick and mortar businesses joint ventures with other related but non competitive businesses can also be highly lucrative, again by opening up markets and customers you don’t currently have access to. The great power of a well executed joint venture is they cost little or nothing to do and you can be bringing in sales almost immediately. Affilliates – Do you have a product but no audience? Consider getting affilliates. For better or worse, the Internet Marketing launch market is built on affilliates and cross promotions. Financing – Could you get more customers if you offered financing using a third party? This is a big revenue source for many car dealers, but can be applied to many business models. Add-On Services & Upsells – Can you increase your client value by offering other upsells from third parties like insurance after buying a vacation, or an SEO audit after buying web design… Could your service be that add-on for others? I am growing PressCable on this very principle. APIs – Could your technology or data enchance another service in return for payment or exposure to their audience… many SaaS business are based on the API model. Republishing – Do you have great content that other sites, newsletters or email lists would benefit from publishing to their audience on an ongoing basis, in return for exposure of your brand, and traffic back to your site or offer. Events & Conferences – Does an event need a speaker or workshop that you could deliver in return for exposure? Click here for a comprehensive list of marketing conferences. Retargeting Sharing – If you have a retargeting list could you advertise another business on your retargeting list if they do the same for you? Solve Another Business’ Customers Problem – A company that can generate traffic for a business might lose customers if those customers cannot convert the traffic, which could be solved if they sell a third party whitelabel conversion tool. Can your product or service help another business’ customers succeed or vice versa? Recommendations – An accountant could send out a letter or an email to his best business clients recommending a cleaning service or a printing service or a marketing service, in return for a commission or recommending their accounting firm. Social Media – A website on business could retweet and share on facebook content from a economic analysis site, and vice versa, to help increase their viral exposure and list. All these examples generate rapid revenue, customer satisfaction, or traffic with minimal costs. 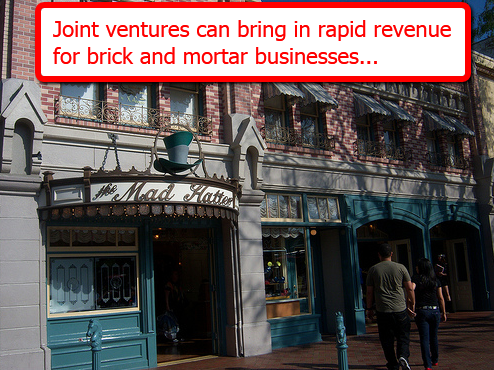 If you’re working with multiple brick and mortar businesses as clients you can also engineer joint ventures between businesses that are non competitive but target the same types of customers. Who do you know that has a large audience that would be interested in your product, services or website? Do you have a number of contacts or potential clients within an industry, that is useful to someone else who has a number of different contacts or potential clients that is useful to you? Who can you find that has a product that your audience would be very interested in? Is there someone that is great at building sales funnels and drive more sales to your product in return for a share of profits or other benefits? Who could train, educate or coach your customers so they get more out of your product, and you share in the fee? Is there a charity that contains your target market that could benefit from your finances or other help? Do you know someone that is well connected in your industry, who could grow your business, and join in from the profit? 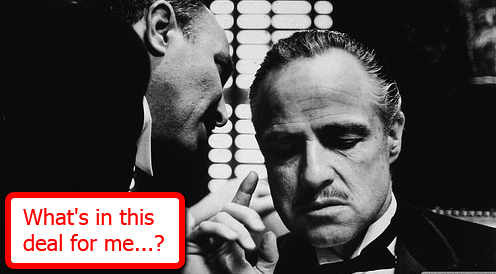 Can you help another business that is weak in an area you are strong, and vice versa? Is there someone who produces brilliant content in your niche that you could give more exposure too? What other businesses share your target audience but don’t directly compete where you could trade advertising real estate to cross promote? What’s In It For Them…? Once you’ve identified a potential joint venture partner who has something you need (like traffic, an email list, the ability to create products or sales pages etc) then you have to think through why they should do a joint venture with you. Put simply…what’s in it for them? Also be aware that for many of the best joint venture partners making money is NOT the first thing they think about when they’re thinking of a potential joint venture. How would this product serve my customers? Will this add to or compete with products and services I’m already offering my customers? Is this person going to fulfill their promises? Are they committed to great customer support? How is this going to effect my relationship with my customers? Will they appreciate it or will it burn them and kill their trust in me? You need to think through what’s likely to appeal to them the most based on their current business and things they’ve said and done in the past. Doing some research on them will help enormously. Read their emails and their blog posts. Ask anyone who knows them well about them and how they operate. Any insights you get can dramatically increase your chances of building a successful relationship. It’s All About Building A Relationship…? So once you know you can deliver something of value and you’ve done some research what’s the first step in making a joint venture with someone? This is like building any other relationship. You need to do what’s appropriate at each stage to get to the point where the person will trust you and be open to doing business with you. If it’s clearly a slam dunk for them (for example you have a huge targeted email list or massive traffic you can send their way) then it can be as simple as contacting them with the idea. On the other hand if they’re already very successful it’s probably going to take a little longer to make it into that inner circle of people they trust. In this situation you can start by doing something useful for them. You might create a special add on report for one of their products that you give to them or you might send them a testimonial for one of their products. You might also just send an email telling them how much you appreciate what they do in the niche and why. Posts on their Facebook page might work in a similar way. The key is you want to think through how you’re coming across with any contact you make and be patient if that’s what’s needed. Some relationships take time and you want to be the guy they’re happy to communicate with…not the annoying intrusion in their life. What is important is to be very clear about what each of you is expected to do and when. If there’s money involved it’s vitally important to put in writing who gets back what, how they get paid and when they get paid. What’s important is that both parties understand exactly what the arrangement is and what’s expected of them. In a large percentage of cases contracts are a waste of time and money. Are you really going to to take legal action against your joint venture partner if they don’t fulfill their part of the deal? When you’re doing a joint venture it’s more effective to take the time to ensure your joint venture partner is honest and has a good track record of dealing with people fairly. 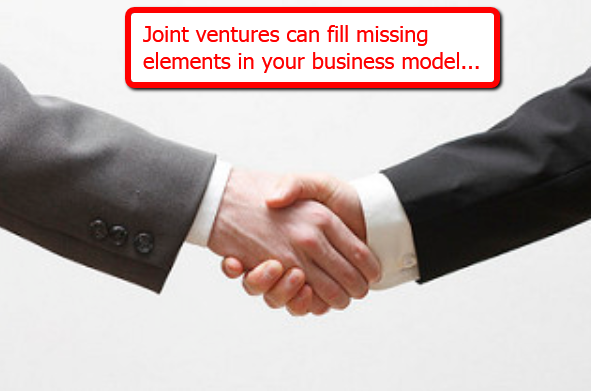 As your joint venture progresses you’ll have a lot more information. One party may be putting in a lot more work than expected or may have more costs than expected. 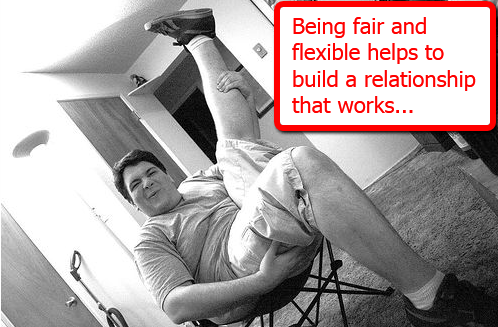 It pays to be fair minded and flexible…willing to change your deal a little so both parties stay happy. Remember that you’re co-operating because you can make income that you wouldn’t earn working alone so try nurture that relationship and help keeping to working for both of you. In niches where joint ventures are common getting a reputation as a person who goes out of their way to look after your joint venture partners will also help you pick up other highly valuable joint venture deals. One tip: if you change your initial agreement put the changes in writing too. You want your agreements to be clear and easy to refer to so there are no misunderstandings down the road. 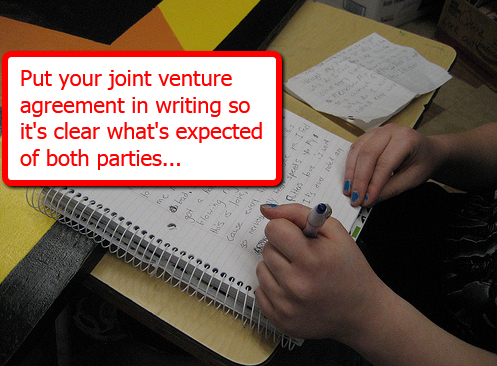 Putting together successful, profitable joint venture deals is a process. You might get lucky and have a highly profitable deal first time out of the gate. 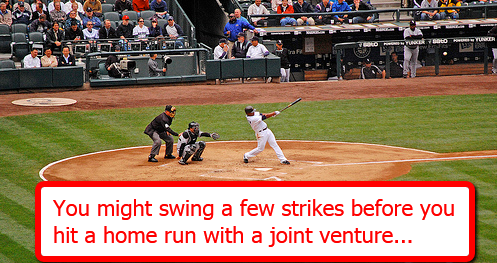 But it’s more likely you’ll have to grow your skills and your business a little before you have a home run. The good news is you can do this over and over until you hit on a joint venture partnership that works for you. Thanks for another great insight. I am a partner in Kyani. The three unique products have transformed the health of thousands of people from around the world over the last 9 years. The financial rewards are uncapped and easily attainable for anyone, with many 5 and 6 figure earners and some even on 7 figures per month. You have got me brainstorming the idea of offering partnerships to groups like heart, arthritis, diabetes and cancer councils in the 62 countries around the world that are open. It would be an ongoing fundraiser and be of enormous benefit to their members. I live in Australia and would like to speak to potential JV partners in any of the other countries who may be interested in pursuing this model. New Zealand, Canada, Russia and the UK are now in pre-launch. Thanks again Chris for your unending inspiration. Very detailed, informative article, Chris. I’d add one comment. Contracts are not simply for suing people. A contract helps the parties to work out any key issues, remember what they agreed to and increases the trust level between them. A JV agreement doesn’t have to be long or expensive, but it is necessary to a good working relationship. I use one with the experts I partner with. The $400 you spend with an Upcounsel attorney to draft your contract is definitely worth the peace of mind you gain knowing that everyone is on the same page and you have an established process for resolving issues. Just as Thomas Jefferson said that ‘good fences make good neighbors’, good contracts help partners stay good friends. Yes very true Dina… it really depends on the type of JV and the type & size of business. I know once you start bringing legal contracts in you can scare off smaller businesses that don’t want to invest in legal fees to check the contract, or feel uneasy because it appears you don’t trust them, or will retaliate if the deal does not work out. At best it will slow down the time taken to get to a finished deal. You don’t need a legal contract to ensure you are both on the same page, and can just be clear on clarifying terms, and ensure it’s written down somewhere. insights for me. So well done and thank you. This information is helpful and worth sharing. Your article is very useful for me. Although, I would love to hear your suggestions to help me out create JVs . we have furniture showroom, wood factory, and design studio. i have been thinking of real estate companies and hotels.